It was in the early 1970s when an aspiring young goaltender from Massachusetts was training with the U.S. National Team at the Met Center in Bloomington, Minn., that he first crossed paths with the owner of the Minnesota North Stars. There was no way of knowing at the time that the encounter would change the course of hockey in the United States. Ron DeGregorio and Walter Bush have been linked as much to the present and future of the game as they are to the past. “He and I had a lot of the same ideas to bring AHAUS [the Amateur Hockey Association of the United States] up to speed and more in line with the visions that we had,” recalls Bush, who preceded DeGregorio as president and now serves as the co-chair of the board for the organization. And now that DeGregorio, or “Digger” as he is better known to his friends, has handed over the reins of an organization he has given his life to, his impact on USA Hockey and the sport he grew up loving in Boston is immeasurable because of his innovative contributions and courageous leadership. Considered a “visionary” by those who know him best, DeGregorio took his passion for the game and infused it with a savvy business acumen and a team-first style of leadership to guide USA Hockey through some challenging times to become one of the top sports organizations in the world. “If I had to say what kind of leader ‘Digger’ has been I would say he was a visionary,” says Jim Smith, who was unanimously elected as the fifth USA Hockey president. DeGregorio’s passion for the game took root at an early age when he began playing street hockey with grammar school friends in East Boston. Those pickup games soon migrated to the local ponds where he spent countless hours playing shinny hockey. Those early days on the pond not only helped him develop passion and skill, but with no adults around to organize the play, he also established early leadership traits that came with choosing up teams, establishing rules and settling disputes. “It was always fun yet competitive,” he recalls. Ron DeGregorio’s enthusiasm for the game and commitment to be the best he could be made him a popular addition to the U.S. National Team. As one of the younger players, “Digger” usually found himself playing goal, where the challenge of stifling older shooters stoked his love of the position. Just a teenager when the U.S. shocked the world by winning gold at the 1960 Olympic Winter Games in Squaw Valley, Calif., DeGregorio began to aim high with his own hockey dreams. And with six members of that team along with head coach Jack Riley hailing from the Bay State, the oppotunity to watch a number of them playing pick up hockey at the local rinks only helped fuel his competitive fire. After a solid career at Boston Latin High School, DeGregorio eventually landed at Middlebury College, where an academic scholarship gave him an opportunity to pursue both an education and play goal at the next level. Following graduation in 1969, he worked various jobs in the Boston area while continuing to play with the Braintree Hawks in the New England League. 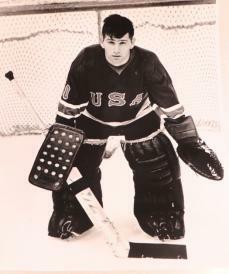 It was there he caught the eye of longtime referee Lenny Gagnon, who recommended to U.S. National Team coach Murray Williamson that he should give the young goaltender a tryout. Even as a “third string reserve goalie,” DeGregorio’s infectuous enthusiasm and relentless work ethic earned him the respect and admiration of his teammates and coaching staff. As the 1972 U.S. Team spent time in Bloomington preparing for the upcoming Olympic Winter Games in Sapporo, Japan, DeGregorio approached Bush about the possibility of learning the business of running a hockey team. In addition to working in the North Stars front office, where he “started licking envelopes” and other odd jobs, he also met Hal Trumble, USA Hockey’s first executive director. After being released as a player for Team USA, DeGre-gorio received a call from Trumble asking if he would be interested in serving as the registrar for the New England District, which at that time included Massachusetts. It didn’t take long for DeGregorio to prove himself to be an innovator as he enlisted the first group of Affiliate registrars to provide more contact at the local level. It was the first of many innovative ideas that included computerizing the existing database, which made it easier to track players. He also created the first regular newsletter that allowed the organization to communicate with its members. And he made a name for himself around New England as the creator of the “Mini 1-On-1,” a shootout contest that became a regular feature on Boston Bruins TV broadcasts. Whether he was playing in an adult tournament or working with kids, Ron DeGregorio’s passion for the game was evident. Before long DeGregorio was making his mark with USA Hockey at the national level, where his creativity and enthusiasm were a breath of fresh air for the organization. Using his business savvy to serve as the organization’s treasurer, DeGregorio helped bail USA Hockey out of a dire financial situation. And with a background in the insurance industry, he encouraged USA Hockey to become self-insured, which eventually led to the creation of HARP. He was also influential in the creation of the National Team Development Program, an idea that was met with significant pushback but, once again, DeGregorio’s inclusive leadership style helped win over dissenters. Having recently completed its 18th season, the NTDP has set a standard of elite player development that has become the envy of the international community, and has invigorated the relationship with the National Hockey League. A creator of the Mini 1-on-1, Ron DeGregorio made a point of putting kids first in everything he did for the game. “If you look at the things that we’ve accomplished at USA Hockey, so many of those things Digger was at the center of,” says Dave Ogrean, who has worked closely with his good friend over the years to form a solid leadership team. In addition to serving two terms as vice president of the Youth Council, DeGregorio was also a director at-large, the organization’s treasurer and the head of the International Council. With so much experience at various levels of the organization, Bush knew he was the right man to succeed him when he announced that he would step down as president. And others would readily agree. With all he’s done in the sport, it could be easy to overlook his success away from the rink. DeGregorio is the founder and president of the PenFacs Group, an investment and insurance firm specializing in the design, administration and funding of executive benefit plans. He also has four grown children with his wife Susan, and three grandchildren. 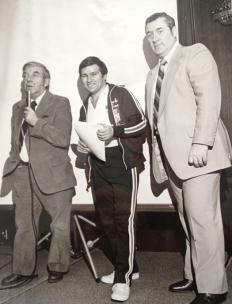 Ron DeGregorio, seen here with Minnesota North Stars goalie Gump Worsley and longtme U.S. coach Dave Peterson. “The people we have as staff and volunteers work together with a common purpose: for participant development, growing the game, and providing a safer environment on and off the ice,” says DeGregorio, who will serve as the co-chair of the board with Bush. “If each of us knows why we are here at USA Hockey, if we are all working together for a common purpose through hockey, we are on the right path. When it comes to summing up his legacy, DeGregorio will leave that to others. 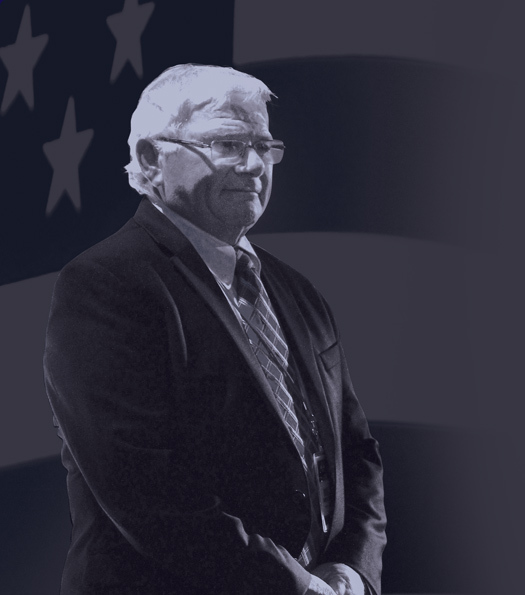 But after 40 years of service to an organization that grew from a shoebox in Tom Lockhart’s New York City apartment to a leader in the Olympic movement, one doesn’t have to look hard to see his fingerprints over every facet of USA Hockey. Thanks to Ron DeGregorio’s passion, intelligence, leadership and commitment to the game, there is certainly a lot to like about USA Hockey.